This hourly rate calculator or charge out rate calculator allows a start-up service business to estimate the hourly rate to charge customers for its services in order to achieve a given level of net income. In addition, it will also provide the number of billable hours the business needs to cover its operating expenses and reach a break even position. The calculator is particularly useful for service based businesses such as freelancers and consultants. The calculated hourly rate allows a business to set the price for its services and can be used as the starting point for a revenue projection based on billable hours to be included in the financial projections template as part of a business plan. Enter the operating costs and required net income Enter the estimated total annual operating costs and the required level of net income for the business. The hourly rate calculator works out the required revenue. Enter the available days a week This is the number of days on average available in the working week. For example is the business does not operate at the weekend, then the available days would be five. The hourly rate calculator works out the available days in a year. Enter the vacation and sickness days The number of available days lost through vacations and sickness is entered and the calculator calculates the number of working days in the year. Enter the hours and non billable hours in a day Enter the number of hours available each day, if a normal day is 7.5 hours then enter 7.5. The non billable hours is the number of hours lost each day carrying out administrative and other tasks which cannot be charged to a client. The hourly rate calculator works out the billable hours per day and year. Hourly rate The hourly rate is calculated based on the revenue required and the number of billable hours a year. 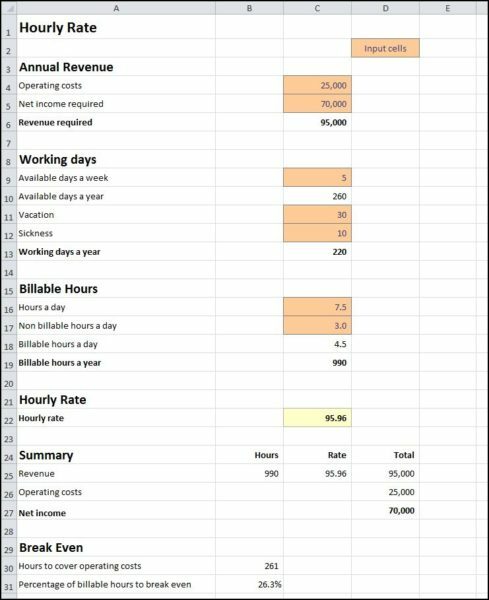 Summary and Break even The hourly rate calculator provides a summary of the revenue, operating costs, and net income based on the hourly rate and the billable hours. It also calculates the billable hours required to cover the operating costs of the business, and the percentage of billable hours needed to reach the break even position. The hourly rate calculator is available for download in Excel format by following the link below. Users use this business hourly rate calculator at their own risk. We make no warranty or representation as to its accuracy and we are covered by the terms of our legal disclaimer, which you are deemed to have read. This is charge out rate template that you might use when considering how to evaluate the hourly rate for a freelancing or consulting business. It is purely illustrative of an hourly calculator. This is not intended to reflect general standards or targets for any particular company or sector. If you do spot a mistake in the hourly rate calculator, please let us know and we will try to fix it.